Last week Michelin courted controversy by announcing that changing a tyre when the tread wears to a 3mm depth is essentially wrong, and that drivers should keep using their tyres right down to the 1.6mm legal limit. So we caught up with Michelin’s research director Bernard Delmas at the Paris Motor Show to ask why the company has taken such an assertive stance on this issue. HJ: The message that Michelin is putting out at the moment is that a 3mm tread depth as a legal requirement is nonsense – is that correct? Exactly. Actually we encourage [this]. We say we should use the tyre to 1.6mm which is the legal tread indicator and that’s true for wet performance, wet conditions, snow conditions. Good quality tyres can be used up to the tread wear indicator at 1.6mm, in good safety condtions. BD: So why 1.6mm? Why not 1mm or 2mm? 1.6mm is a historical tread wear indicator in Europe [and] all over the world. It has been established for decades and performance of tyres has been improving over time. Today, at the 1.6mm tread wear indicator the gain in safety conditions are absolutely met. And that’s [why] we say there’s no reason to remove the tyre earlier. Could you go down to a lower depth than 1.6mm with a good quality tyre and find it still works ok? We don’t think so because at the end you would end up with slick tyres and you still need some minimum tread depth to evacuate the water, especially [to prevent] hydroplaning. You need something to catch the road. Where does this 3mm requirement come from? Do you think cheap tyres are the reason? Yes there may be several reasons for that. First, there are some actors in the market encouraging [it]. They say 3mm, sometimes 4mm - why not 5mm? You have to realise that when a tyre is on the car, it’s not new anymore, it’s already wearing. Legally it’s been said 1.6mm, [but] some people are starting to say 3mm, 4mm, which is almost half of the tread depth, which is an absolute waste for the economy. If you remove the tyre at 3mm instead of 1.6mm it means you have one tyre per car every two years to be added – which is enormous. On top of that you have the materials necessary for making the tyre, which are wasted as well, and then you have a very interesting effect which is the fuel economy and CO2 generation. At the same time the tyre is wearing, the rolling resistance of the tyre is improving, which means that if you remove the tyre at 3mm instead of 1.6mm you are not going to use the tyre at its best, and [that] has an impact on fuel economy, degrades it, and creates more CO2. So, when we say use your tyres to 1.6mm instead of removing at 3mm, you gain on the tyre, on the material to remove the tyre, on the fuel you save, and even the CO2. So today, with the world we are facing - the society, ecology - it’s very important that people know about that. Also the tyre is safe at 1.6mm. There’s no reason to remove [it] before [that]. Tell me about low rolling resistance tyres then. I’ve driven cars on low rolling resistance tyres and you can feel that the grip isn’t there when you’re braking at times. Isn’t a low rolling resistance tyre just a tyre with less grip? No. It should not be. You have to manage many performances at the same time: the grip, wet, snow, dry, you have the handling, comfort, noise and rolling resistance and, very important, the longevity of the tyre. You can have two approaches. One is to say, “I degrade one performance I improve another”. I can improve the rolling resistance by degrading longevity or wet performance. We don’t do that at Michelin. We add technology to the tyre in order to improve some performances. To take all the performance together and improve tyre by tyre, generation by generation, to improve performance. For us, a low rolling resistance tyre, a green tyre, is a tyre which improves rolling resistance, which means better fuel econmoy for the car, less CO2, but keeps all the performance equal. Now, if you ask me if all the tyre makers [are] doing like Michalin is doing I will not answer the question, but I know what Michelin is doing. For us a low rolling resistance tyre is always as good in other performance [areas] as the previous generations [were]. Very important. The above text has been edited slightly for length and clarity, but you can listen to the full ten-minute interview below, which includes talk on winter tyres, the future of tyres and Michelin’s new Cross Climate Plus. 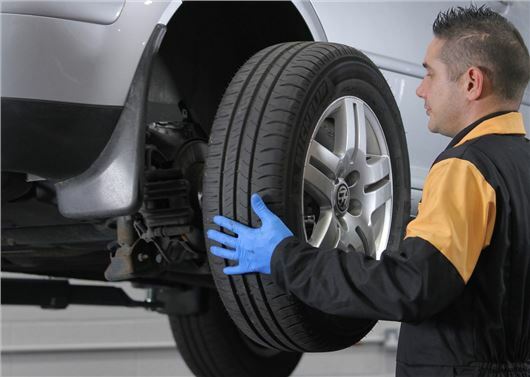 I'm skeptical - why would a tyre manufacturer advise car owners to run their tyres for longer and thus reduce sales....unless their tyres are going to wear quicker from now on! They won't reduce sales. If one manufacturer says "replace our tyres at 3mm" and another says "replace our tyres at 1.6mm" the second manufacturer will get more sales. Also if manufacturer A costs says £200 for a tyre and says run it to 1.6mm and Manufacturer B tyre costs £100 but change it at 3mm or 4mm then Manufacturer B's tyre is no longer cheaper; in fact one could say more expensive. Er Nigel... new tyre worn from 8 mm. Manufacturer A to 1.6mm = 6.4mm wear . £200 for tyre/ 6.4 = £31.25 per mm. Manufacturer B to 4mm = 4mm wear. £100 for tyre/4 = £25 per mm. Manufacturer B is cheaper by 25 %.